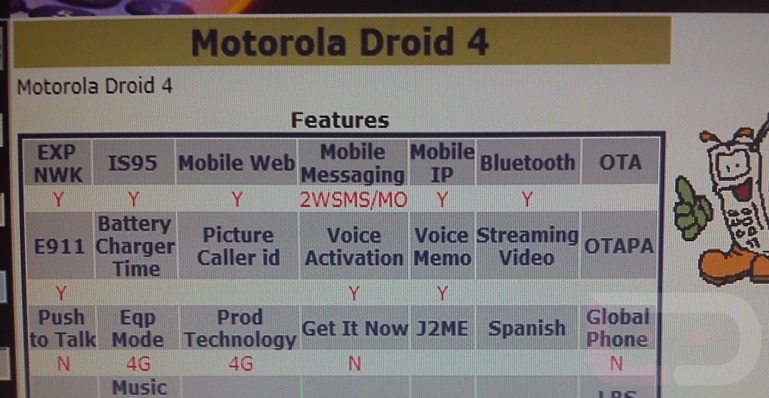 Motorola DROID 4 Pops Up in Variety of Verizon Systems, How Close are We to a Release? The Motorola DROID 4 may be closer than any of us had imagined. We brought you the first photos of the device a couple of weeks back leading us to wonder when it may appear, as the device pictured looked almost ready for prime time. So now that we are seeing it appear in a couple of different Verizon systems, we wonder if it could be Moto and Verizon’s big December release? You may remember that the XOOM 2 popped up in this same system with 16GB, 32GB, and 64GB models on October 23 and is now tentatively-scheduled for a November 30 release. So if the D4 is now showing up for testing purposes and for internal system setup, there is a chance that it could be here within a month or two. Now, we won’t know for sure if the XOOM 2 will be here at the end of the month until we get to the end of the month, so let’s not place any bets on the D4 just yet. The month of December is wide open, without anything currently rumored though. Shot of the D4 in Device Manager after the break. Still ready to have a slider with 4G LTE and impressive specs? I’m assuming the Stratosphere wasn’t necessarily what any of you were looking for.